*This publication replaces DA Pam 20-236, June 1953. The material for this study was prepared for the Historical Division, EUCOM, by a group of former German generals and general staff officers. The principal author, former Brig. Gen. Alfred Toppe, and most of his associates served for extended periods on the Russian Front during World War II. Moreover, most of them held assignments involving troop training. The reader is reminded that publications in the GERMAN REPORT SERIES were written by Germans from the German point of view, and that the procedures, tables of organization and equipment, combat doctrine, and staff methods of the German Army differed widely from those of the U.S. Army. 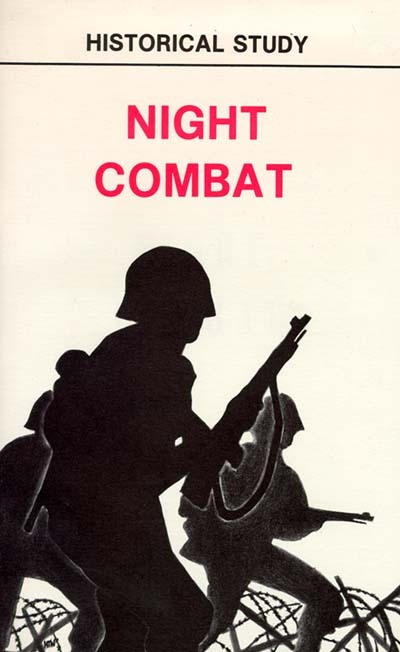 It is interesting to note, however, that, in conformity with the German recommendations made in this study, our own programs are placing increasing emphasis on night combat training. Final editing of this study was done in the Foreign Studies Branch, Special Studies Division, Office of the Chief of Military History. The draft translation of the original German text was first revised and then reorganized in the interest of brevity, clarity, and pertinence. In this process every effort was made to retain the point of view, the expressions, and even the prejudices of the authors.